Globalization 4.0 was the theme of this year’s World Economic Forum Annual Meeting, but with many world leaders not making an appearance (Trump, Yi Jinping, Putin, Modi, Trudeau, May, Macron) media mentions were down by 1 million from 2018 and the media focus consequently shifted. Here, Golin’s Insights team review the data to unpick key topics and trends in media coverage from Davos. Davos coverage cleaved into two distinct camps this year, with little connection between them. Issues such as AI, climate change, the future of work and female leadership generated big headlines, but separately, discussion around international politics and the economy were wide-ranging, from Russian international relations to IMF economic forecast. Technology and the future of work was by far the most prominent media topic – making every seventh mention (14%). Key sub-topics clustered around the need for more equality in the tech sector and the workplace, providing more opportunities for global youth, the potential benefits and risks of AI, blockchain and other emerging technologies. All underpinned by the need for greater inclusivity on the path to Globalization 4.0. 9.7% of Davos conversation was criticism. Led by an Oxfam report on inequality, global leaders skipping the event due to domestic troubles and fleet of 1,500 jets tasked with Davos transport. Media were quick to spotlight attendees critical of Alexandria Ocasio-Cortez’ plan to tax the rich and climate activist Greta Thunberg’s address to Davos (and her protest) received media pick-up. This led British newspaper the Independent to comment: is it time to end Davos and create a new, more inclusive global conference? Inequality was a key topic at Davos and often difficult to distinguish from the event theme, Globalization 4.0. Within the technology and future of work cluster (14%) there was concern as to how to remove gender and other bias from AI algorithms. The annual Oxfam report on inequality highlighted the increasing gap between rich and poor. Even business and world leaders acknowledged that Globalization 4.0 must focus on democratising access to new technology and ensuring technological progress impacts all levels of society. Perhaps more so than previous years, individuals and their talks or comments made a dent in the Davos media coverage. Key figures this year were the ‘Trump of the Tropics’ Jair Bolsonaro (5.9%), TV presenter David Attenborough (3.9%) on climate change in his fireside chat with Prince William, climate activist Greta Thunberg (3.0%), financier George Soros on the dangers of China and AI (1.9%), and US politician Alexandria Ocasio-Cortes (1.7%) on taxing the rich. 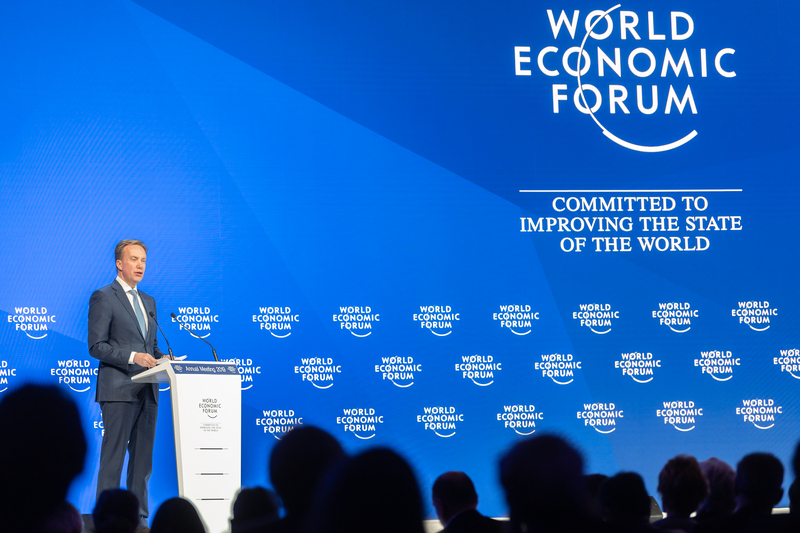 Davos 2019 saw an unprecedented absence of national leaders, but the absence arguably allowed issues such as climate change and inequality to achieve media salience. With the current business, political and economic climate, we can expect issues surrounding inequality to be a persistent theme in media coverage throughout 2019. As published on Golin UK Blog.